What are the benefits of our Environmental Management System consultancy and auditor training as per EMS 14001:2015? Minimizes the risk of regulatory and environmental liability fines. Reduces waste and consumption of resources. Increases long term viability of businesses. Identifies possible areas which can save costs such as recycling, landfill costs, utilities. Positive response from investors, lenders,and insurers. Global Certification Consultancy offers EMS 14001:2015 Environmental Management System awareness and auditor training presentation for ISO 14001 Certification, which is prepared by a team of highly-qualified management professionals and experienced Environmental System Certification & Training consultants. This ISO 14001 Training presentation is very useful while conducting corporate training within the organization or any work area. Our many clients in USA and many other countries have already used our ISO 14001 ppt presentations to provide ISO training to their employees with help of powerpoint slides. Our ISO 14001:2015 awareness and auditor training presentation is provided in editable format. This environment management training presentation kit is pleasingly presented and designed to clearly communicate the message. The companies interested to get EMS certification now need to establish a much better environmental understanding as per revised ISO 14001:2015 standard, released on 15th September, 2015. Our kit helps to fulfil this need of the companies. What Does EMS 14001:2015 Awareness Training Presentation Kit Offer? Topic-wise, ISO 14001 Awareness and Auditor Training presentation kit contains following 11 modules. (More than 300 Slides). Overview of ISO 14001:2015 EMS. Definition of various environmental terms. ISO 14001 requirements in detail, for effective EMS Certification. Environmental Management Aspect - Impact steps. EMS 14001:2015 Environmental Management System documented information. ISO 14001:2015 Environmental Management implementation steps. Environment objectives, targets and EMP. Awareness on ISO 14001 Environmental Management for vendors. Workshop 1 & 2 and case-study to examine the learning of participants. This ISO 14001:2015 Training kit comprises more than 300 ppt slides, each pleasingly designed to get the message over and establish a much better environmental understanding. It also describes how to implement ISO 14001:2015 standard and drills down into all the relevant topics. This part includes write-up in MS-word for reading and understanding of participants, and ready-reference to the trainer. A question bank of over 400 audit questions for each departments (based on ISO 14001:2015 Environmental Management System requirements) is given, which can be customized to make your own internal EMS audit checklist. 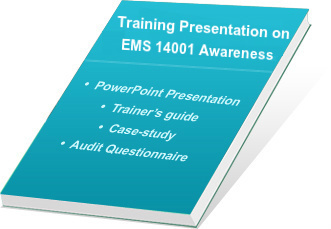 Why to Purchase Our EMS 14001:2015 Awareness and Auditor Training Presentation Kit? The soft-copy of presentation and hand-outs are given and one can edit them as per their own requirements. Hand-outs written in word 2007 and Presentation made in Power point. Developed under the guidance of experts on ISO 14001 Certification and globally proven consultants having experience of more than 25 years in International system certification consultancy. User-friendly and easy-to-learn; one can add company logo as well as voiceover for the training of staff on Environmental Management. During preparation of training kits, it is verified and evaluated at various levels of our team and more than 1000 hours are spent in preparation of this training presentation kit. On successful completion of purchase, we provide username and password to download the product from our FTP server. We provide instant online delivery of our products to users by sending username and password by e-mail. This EMS 14001:2015 Environmental Management Training Presentation Kit is available at very compatible rate and anyone can purchase it with secure transaction by Paypal.com. We ship worldwide and our products are used in more than 65 countries.